Desk Deals with confidence and speed. A desking tool built with speed and accuracy. In the real-world, a desking tool has to prioritize speed without sacrificing quality. That’s why DealerPeak Desking combines innovative features like windows-based architecture that allows for quick access to multiple deals simultaneously, with instantaneous incentive programs that stand up to any bank. Packed with valuable features and optional additional products, DealerPeak Desking is all about injecting efficiency into the desking process and helping you refine your craft. Your desk manager can work multiple deals at once with a windows-based architecture built for efficiency. This is a desking tool that understands that when you’re at your busiest, the ability to switch back and forth between deals in seconds is essential for productivity, and for creating a better customer buying experience. Accuracy you can take to the bank. Your deals will stand up to the bank thanks to a rigorous quality control process that’s second-to-none. Desking calculations are matched to those in your DMS to allow for multiple lease and retail scenarios. Manufacturer programs and incentives are available in real-time, which allows you to maximize the profitability on every opportunity. Everything you need with one click. 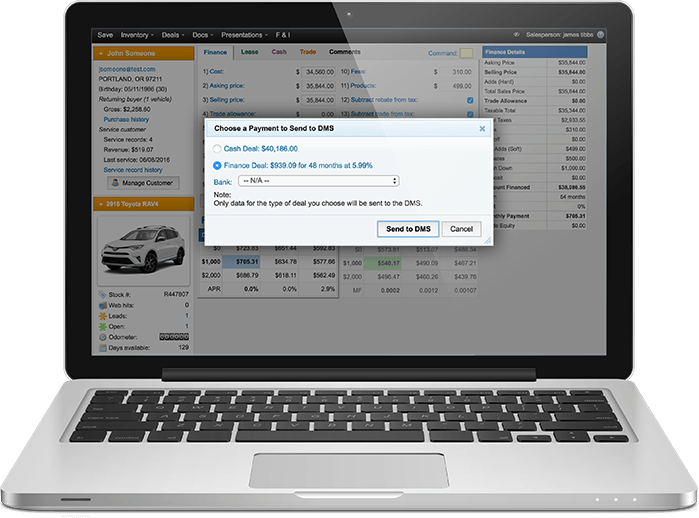 View all the details on one screen as you desk your deals, including buyer and co-buyer information, credit application information, available OEM programs and residuals, vehicle of interest information, trade information, finance and lease payment options, presentations, and even send the deal to your DMS! Everything you need for peak performance. Forget viewing only one payment option at a time; instead view up to 9 payment options at one time for any deal. 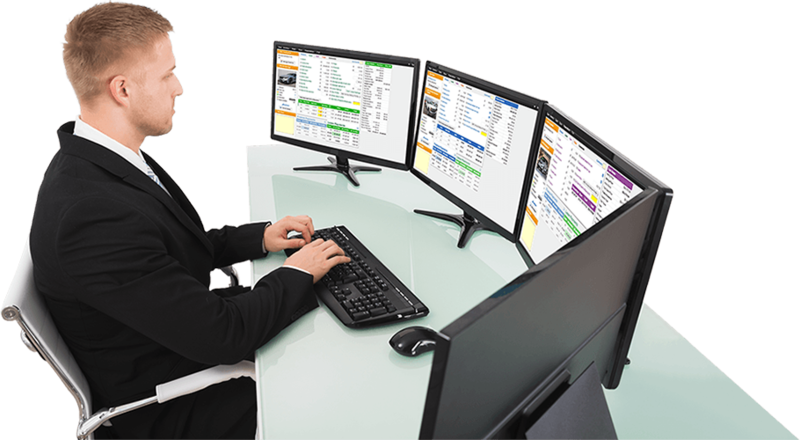 Desk as many vehicles as a customer requests within one window, and switch between vehicles with just one click. Finance, lease & cash deals. 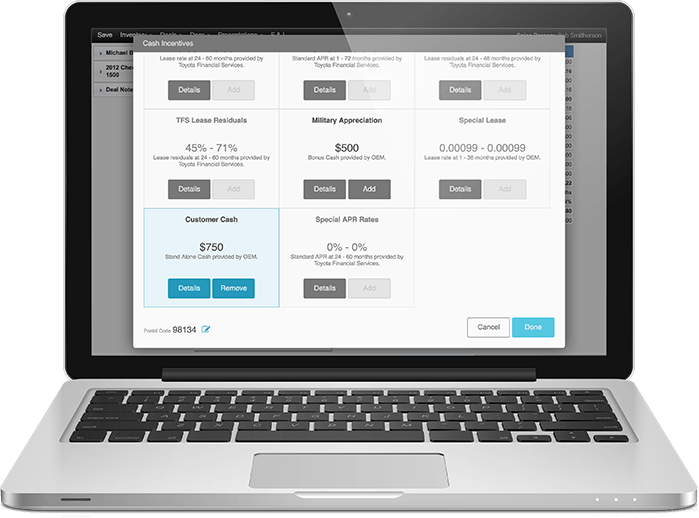 Compare a lease and a purchase on one screen, allowing all buying options to be presented to the customer. 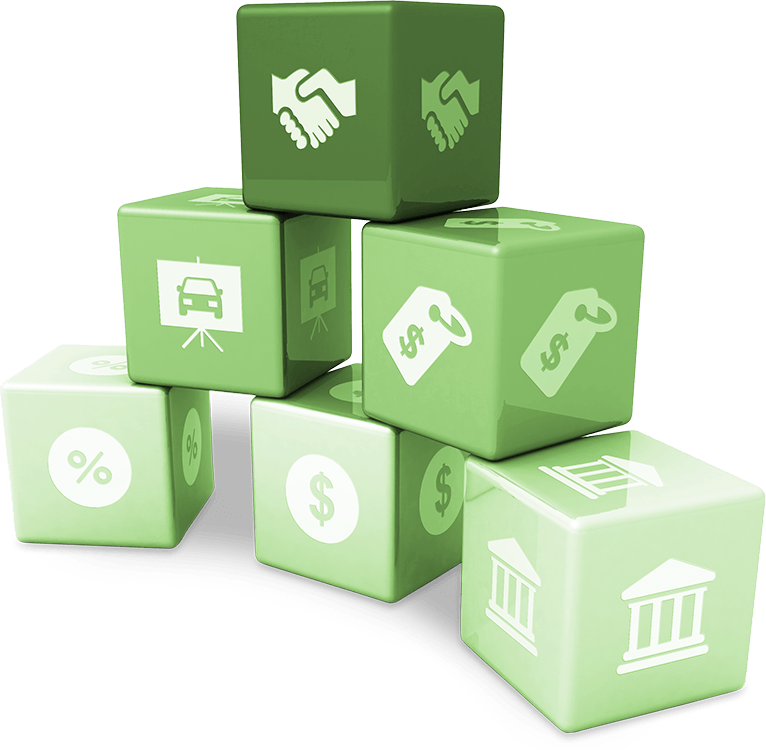 Easily roll a deal without doing the math, or manually backing into a desired payment or finance amount. Maintain control of the Desk. Personalize what deal details each salesperson can see to retain gross and control. Choose from over 30 standard presentations to provide your customer with purchase options online or in-store. Generate an electronic credit application right from your desk to eliminate double data-entry and hand-written apps. Quickly switch between State and Local tax groups within a deal. Save time, maintain credibility, and make the best customer impression by enabling your sales people to communicate back-and-forth with the Desk without leaving their customers. Make your desking tool even more powerful. These optional products will help you control and manage the speed, efficiency, and profitability of every deal. Push deals to your DMS directly from the desking tool. Your F&I Manager will appreciate having more time to uncover profit opportunities and review the deal, instead of slowing down the process with manual data entry. Create efficiency by eliminating the need to reference a third-party source. Having available regional-based OEM incentive programs in the desking tool allows you to calculate the best purchase scenarios quickly. Appeal to today’s tech-savvy customers by allowing them to negotiate their entire deal online. 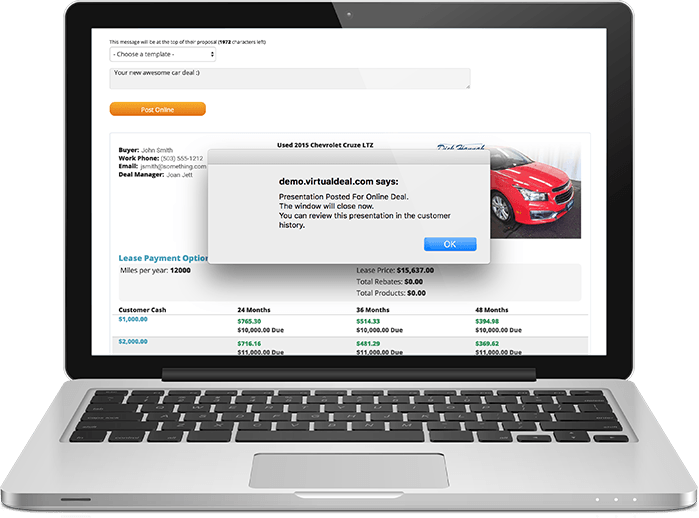 From your website inventory, they can request purchase and lease payment options, apply for financing, value their trade, and even reserve their vehicle. Fill out the form below. We’ll respond within 24 hours and, of course, always keep your information private. You can also call us directly at (888) 289-9841 or email our sales team at sales@dealerpeak.com. © 2019 DealerPeak, LLC. All rights reserved.